An Egyptian plumber beat his wife to death upon learning that she had not voted for Muslim Brotherhood candidate Mohammed Mursi. An Egyptian plumber in Alexandria beat his pregnant wife to death upon learning that she had not voted for Muslim Brotherhood presidential candidate Mohammed Mursi, the Egyptian daily al-Wafd reported on Sunday. According to police reports, the initial argument between the unnamed couple escalated into a violent death, despite the pleas of the battered and bruised wife. She was reported to have died at the hospital from injuries sustained. Domestic fights have dominated Egyptian news headlines when the bid fell on the two most feared and most controversial candidates, Mursi and former prime minister Ahmed Shafiq, Al-Arabiya news reported. 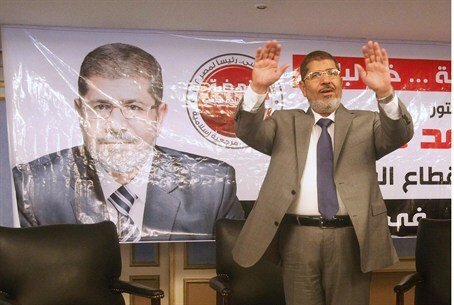 Mohammed Morsi was declared the winner in Egypt's first free presidential election in history by the country's elections commission on Sunday. In his first televised speech on state TV, Morsi pledged Sunday to preserve Egypt's international accords, alluding reference to the peace deal with Israel. Prime Minister Binyamin Netanyahu issued an official reaction to Mursi’s victory saying, "Israel appreciates the democratic process in Egypt and respects its results," said Netanyahu.